If you are looking for a mind-blowing scenic spot in Langkawi where you can swim from one of the several lovely beaches, or snorkel or even scuba dive amongst spectacular corals and marine life, then Pulau Payar Marine Park is the place to go. Pulau Payar is an island which is located 30kms south of the main Island of Langkawi. It takes about an hour to reach by a speed boat from the Kuah Jetty (i.e. the ferry terminal at Kuah town of Langkawi). From Penang it is about 51kms to the north. So the Payar island lies in between Langkawi and Penang. Large boats are not allowed to dock at the small jetty at Pulau Payar. Recently the water area here has been developed as a Marine Park. It now includes several nearby islands as well. The Marine park comprises of the islands Pulau Payar, Pulau Lembu, Pulau Pulau Kaca, and the isolated island Pulau Segantang which is located some 13kms away. The entire Marine Park is marked as fisheries protected area since 1985, so you can expect abundant fish and marine life here. Pulau Payar Marine Park is the only place off the western coast of peninsular Malaysia which has exotic coral reefs and marine life similar to that of the Indian ocean. In marine life, you can see horse-eyed jacks, moray eels, clown fish, two meter long groupers, black-tipped reef sharks, black spotted puffers, barracudas and many other exotic marine species. Pulau Payar also has the widest range of coral reef species in the whole of Malaysia that includes Tubastrea Micrantha, Semi Precious Antipathes etc. All these reefs serve as breeding ground to many different types of fish and also act as natural barriers to sea erosion that takes place at the coastal lines of the small islands. Once your boat docks at the jetty at Pulau Payar Marine Park, there is an wooden walkway (a narrow boardwalk) that leads to the beach area. There are four small beaches in Pulau Payar. The best in my opinion is the one to the left. From any of the beaches, you can swim or snorkel. The water here is calm, sheltered and shallow. The usual water visibility is between 30-50 meters. However, sometimes in the morning the water may become a little murky. There are plenty of harmless sharks (black-tipped) in the waters here. Even when you snorkel from the beaches and go about 20 meters into the open sea, you can sea baby Black Tipped Sharks. Don't get scared, they never do any harm and shy away when they notice a human being close by. Take an underwater camera so that you can prove to others that you actually swam with the sharks that big. There are of course many other different kinds of fish that you can see in the waters here including parrot fish, angel fish, dameselfish, the rare rabbitfish, butterflyfish, anemonefish etc. One of the best places to snorkel is under the bridge (jetty) where you can see the maximum number of fish and marine life. This is where you can meet the resident Mr Mustaffa, the giant Barracuda. Other than swimming and snorkeling from the beach, you can also hand feed baby sharks from a section on the bridge. The authorities don't let you hand feed them from the beach itself because you don't want to after all touch them. They may look cute but do have real teeth. Around noon time, representatives from the Marine Park Administration initiate shark feeding session when you can see them real close from the shore and also participate in feeding. 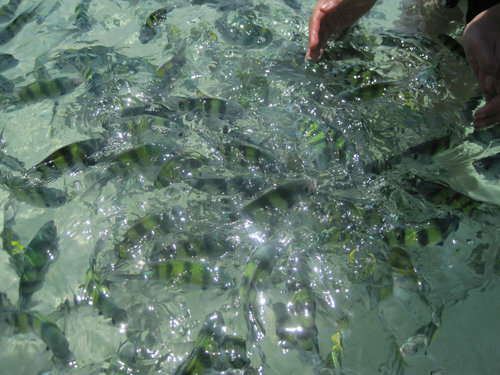 Some packages will offer you offshore snorkeling which requires a boat to take you to a reef area. One such great offshore snorkeling area in the park is at House Reef which is near the eastern coastline of Pulau Payar island. One of the operators (Langkawi Coral Platform) has their own offshore floating pontoon from where you can snorkel. You can see many colorful boulder corals, brain corals, stony and knob corals. Other than magnificent corals, you will also see fish like butterfly fish, moray eels, Lion fish, groupers, butterflyfish, rabbitfish, parrotfish, wrasse and lot more. You will snorkel alongside the harmless black tipped sharks... the experience is awesome. There are great dive sites and facilities available here for both certified scuba divers as well as the first timers. If you want to try out diving for the first time among multi-colored corals and exotic marine life, this is the place to try. Most operators offer 'Discovery Scuba' package that includes introductory lessons and personal hand holding by a professional certified guide to give you a first time amazing experience. All you need is swimming ability and little sense of adventure. However for the certified divers, the options are far wider. There are plenty of dive sites within the Pulau Payar Marine Park area. This is the only diving area in Langkawi and can compete with any other great site worldwide with its amazing array of corals and marine life. You will find soft corals with great diversity of colors, and hard corals like Boulder, Staghorn and Brain corals. One of the top dive sites here is the 'Coral Garden' located at the south western end of Pulau Payar. It is full of colorful soft corals and great marine life. This is probably the most popular sites within the divers. Other great dive sites here includes Grouper Farm (close to Coral Garden), Japanese Garden, House Reef, Lobster Garden, Sunken Boat Point, Shark Point, East Marine Garden, Rock Point, Lembu Rocks and Goodyear Reef. All these areas offer spectacular corals as well as colorful marine life. You will get to see groupers, stone fish, moray eels, sea horses, barracudas, parrot fish, angel fish, snappers and lot more. There are also artificial reefs created in the marine park - Type Reefs and Boat Reefs. They are marked with yellow buoys. Check out Top Dive Sites in Langkawi to know more about the great dive sites at the Marine Park and what you may experience there in terms of the varieties of fish, corals and other marine life. There are toilets and changing rooms available, and also shaded rest areas with benches & tables to have your food. However note that the showers at the changing rooms spray sea water and not fresh water. The marine park beach also has the Marine Park Head Quarter and an exhibition area. Usually all packages offered by the well known operators include complimentary snorkeling gears (snorkel, mask & life jackets), and dive gears (if you take the dive package). However fins are not allowed in the park for both snorkeling and scuba diving as the marine park follows 'no fins policy'. This is to avoid damaging the corals and fish. Packages also include lunch packs. Note that the authorities at the park promote Eco Tourism and ensure adequate ecological balance & marine conservation. So you can not collect and take away shells, corals or marine creatures in any form. During the season, the marine park can get really crowded. This is one of the hot attractions of Langkawi and majority of the tourists target to come here. But unfortunately many do not follow the prohibitory Eco Tourism laws and sadly litter the water area. This happens mostly when the place gets crowded. There are no resorts allowed in Pulau Payar. So the only way for night stay here is by taking prior permission for camping from the Fisheries Department in Alor Setar or their Head office at Kuala Lumpur. Jenny and her team will guide you all through the tour. They depart in the morning from their private marina at the Royal Langkawi Yacht Club in Kuah town. After arriving at the Pulau Payar Marine Park, the day is left at leisure for swimming, snorkeling etc from the beaches and hand feeding the baby sharks. The divers can take optional activity of diving from their dive boats at various sites. Both Discovery (beginners) and certified dives are offered. The package includes lunch. Additional snorkeling and diving activities may be undertaken in the afternoon before returning. Check out Snorkeling & Diving Operators to know more about the top operators, the packages and contact information for inquiry & booking. They have a Floating Reef Platform located 100 meters off shore (from Damai beach of Pulau Payar). Their boat leaves the Kuah Jetty in the morning and takes you to this platform. You can opt for snorkeling or diving package. Snorkeling and beginners diving take place from the platform itself. Experienced divers are taken to other dive sites. They also have an Underwater Observatory from where you get a fish eye view and see the marine life from a glass gallery without getting wet. There are nice & clean toilets and showers (fresh water) available at the floating platform. The package includes lunch. 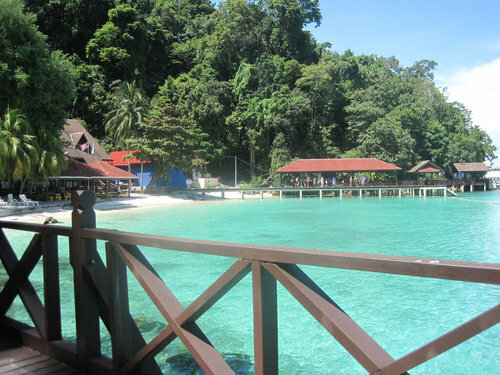 In the afternoon they take you to the island beach and also for a glass bottom boat tour before returning to Kuah. The package includes hotel transfers. We did a snorkelling tour of Pulau Payar with East Marine in January 2019 and it was our most disappointing experience in Langkawi. Staff were disinterested, lunch was bad and it seemed very disorganised. Worst of all we were taken to a small crowded beach snorkelling site were all the corals were dead and it was not possible to explore the island. So I strongly advice against going to Pulau Payar with East Marine tours. There were many other tour groups also marooned on our terrible beach so I don't know if its worth going to Pulau Payar at all, be careful booking a tour. Hi, I went to Pulau Payar with Langkawi Coral two days ago 13 Jan 2019 with platform package, visibility is not good, very bad almost 3 meter visibility. There were many groupers there 1m-1.5m long. Langkawi Coral service is not so good. My knee has problem but they asked me to carry the tank. Over there they do not have towels and even not available for renting. I left my RM 400 touch light in rented BCD but they said it was not found or maybe being taken by other diver. But I am the last one to use that BCD, and no other customer used that BCD when I called them. Diving with Langkawi Coral gave me a very bad impression with their services.